As with my post last week on Calabrisella, little gems can pop up in the most unexpected of places. 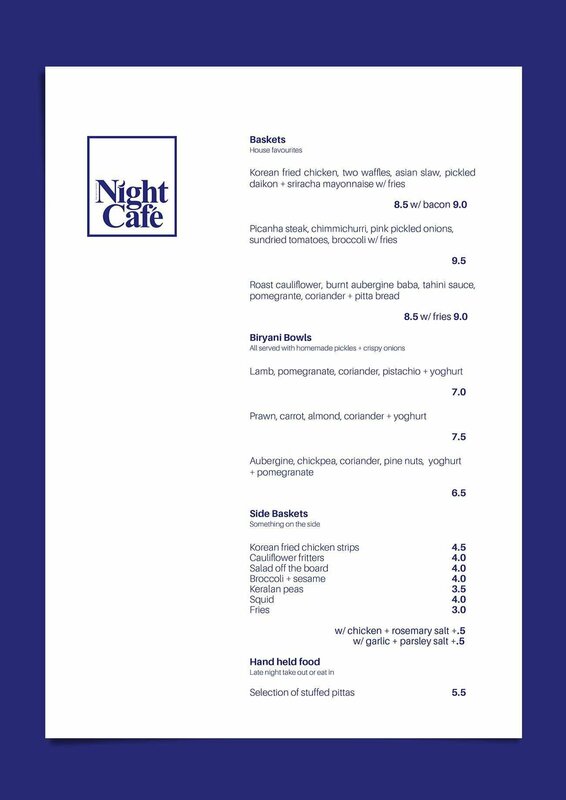 Blue Honey Night Café (or is it just “The Night Café” – some of the branding would suggest the latter, their Instagram monicker the former) is another example of a somewhat bland facade hiding a rather interesting – food wise — proposition. Open in the evening in the space occupied in the day by the Cardiff institution that is Sully’s, it takes a different approach (rather more adventureous) to that of the daytime Sully’s. I like Sully’s as it is a no nonsence cafe/greasy spoon, offering decent good value food. I think, however, it is a clever idea to allow the otherwise dead space in the evenings to be used by someone else with an interesting concept. We have seen this with pop ups in Cardiff, but not so much with a more permanent duality of usage (day and night). This seems to me to be a really good idea. 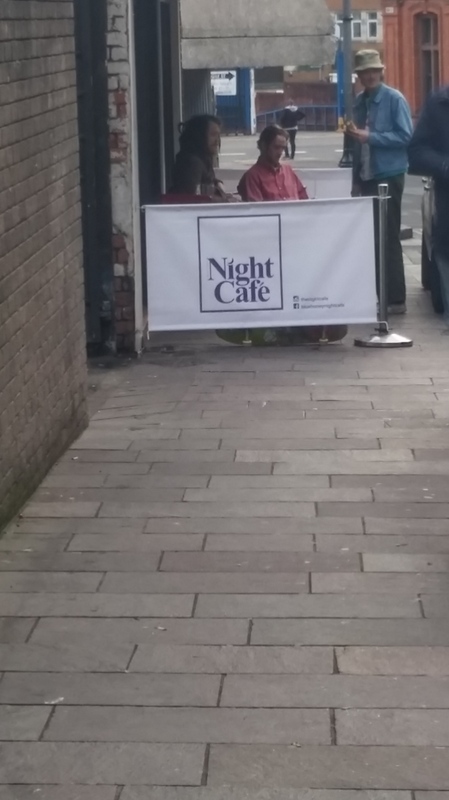 Sat opposite one of my favourite restaurant in Cardiff at the moment, Asador 44, Blue Honey Night Café/the Night Café seems (at least to me) to seek to cater for those looking to counter the munchies. 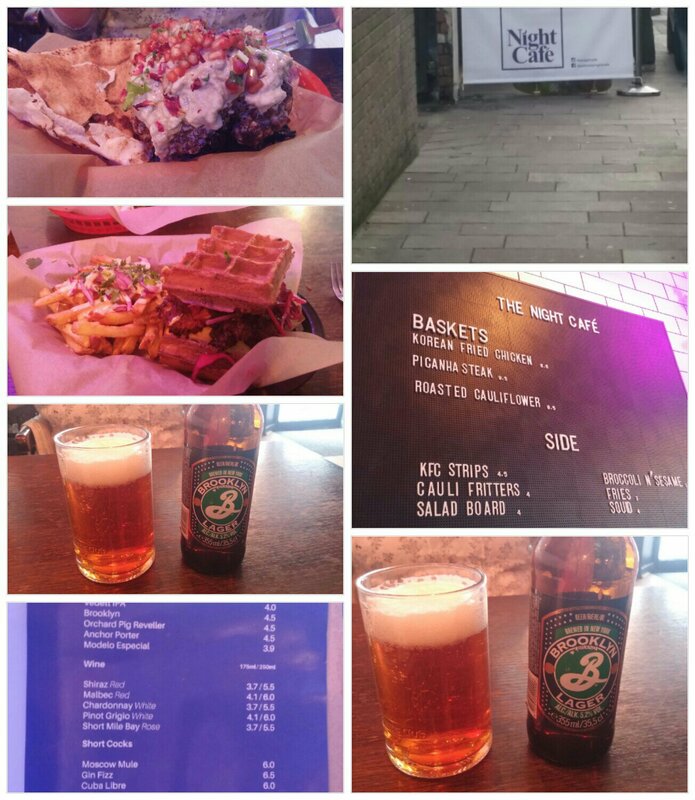 A pit stop after a visit to the cinema or between bars is a welcome addition to the city centre, with decent (non curry/chippy/burger chain) late night bites not that easy to come by post 10pm in Cardiff City centre itself (richer pickings can be found further out). Opening from 5pm until 1pm (food service starts at 6pm), it caters for the needs of those who want to fuel up before, during or after hitting the town, as well as those with anti-social working hours such as in the catering industry. but not that much. A veneer of trendiness over what is daytime Sully’s. The atmosphere is, however, totally different. Much to Mrs. SF’s delight they were pumping out (actual to my relief at a fairly restrained volume) a mix of late 70s/early 80s metal. One of the rather charmingly laid back chaps running the place said (almost by way of an apology) that they normally play more chilled out tunes, but when Mrs. SF said she was enjoying the music, he (rather pleased with, I suspect, our slightly surprising response) didn’t change the tracks. A medley of Black Sabbath, Deep Purple and AC/DC (Mrs SF was a bit of a “Metal” fan in her youth) tracks ensued, before it slowly changed (via a bit of Blue Oyster Cult) to the Doors and the Cure (the latter two more my style). The menu is short, but sounds rather lovely. Whilst on their Facebook page it refers to Biryani bowls, these are currently unavailable. I asked and they said these will be on offer shortly (potentially this week), with a biryani and jazz night one of the ideas being muted going forward. The offering on the night of our visit was limited to the rather 70s sounding “Baskets”, stuffed pittas and sides. I recall many a dodgy work’s night out (rather later than the 70s – even I am not quite that old) where the food offering of “chicken/scampi in a basket” meant a very mediocre meal indeed. As for waffles, in those days, it was invariably a Birdseye potato waffle. Supposedly “so waffley versatile” (as the annoying advert went), but actually “so waffley bloody bland”. Only edible with copious amounts of HP sauce. Here the “chicken in a basket” offering was rather more superior. 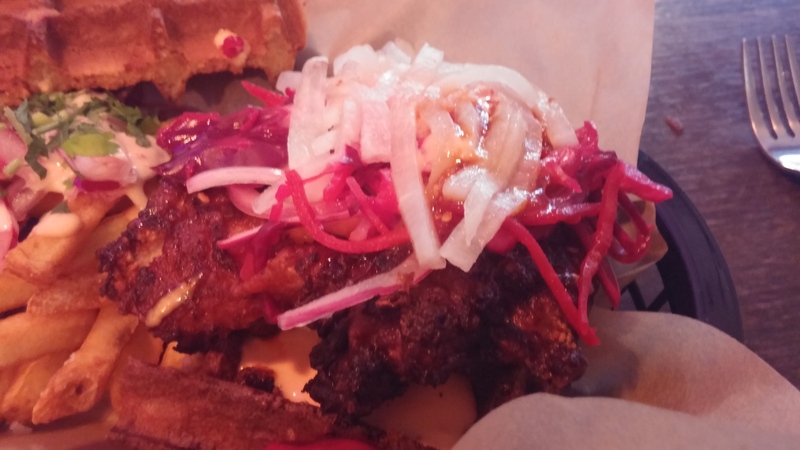 The chicken is Korean style fried chicken sandwiched between proper Belgium waffles, plus Asian slaw, pickled daikon, sriracha mayo and fries. All this for a bargain price of £8.50 (£9 with bacon). Many regard the South of the USA as the spiritual home of fried chicken, but I think the Koreans give it a pretty good run for its money in claiming to offer the best fried chicken around. I was torn between the said Korean chicken (a good piece of fried chicken is a rare thing in Cardiff) and the equally lovely sounding picanha steak with chimmichurri (£9.5 with fries). Picanha (a popular cut of meat in Brazil – we refer to it as rump cap) has a lovely flavour to it if treated right (has to be rare – as can be seriously tough if overcooked). Add the accompaniments of pink pickle onions, sundried tomatoes, broccoli and fries and this was very tempting. 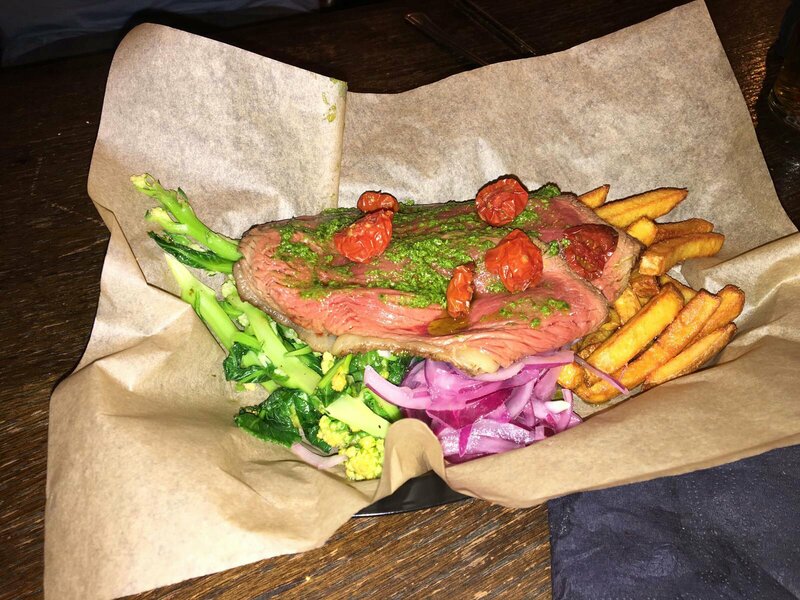 A friend in work sent me a picture, after my visit, of the picanha and it does look seriously good (cooking of it looks spot on to me). After much indecision (we were on the clock, this being a pre-cinema bite to eat before we went to see Guardians of the Galaxy 2 – good/bad you ask – “A bit of both” as Peter Quill would say – good but not half as good as the first one and I though the Kurt Russell character was a bit rubbish – any sci-fi film worth its salt needs a “good” baddie and Kurt Russell’s Ego was not that) and not having the benefit of the picture of the picanha (above) before hand, I concluded that chicken was the thing to go for. This was also, at least in part, due to this place being opposite the best steak joint in Cardiff by a country mile, in the form of Asador 44. I would, I reasoned, be comparing their picanha with the dry aged £10 lunch one at Asador 44. The chicken, on the other hand, offered the promise of something not readily available in Cardiff city centre in the form of a decent piece of fried chicken. The chips were just good rather than really good (probably weakest element of the dish – I could happily have lived without them if replaced with more of the Asian slaw). 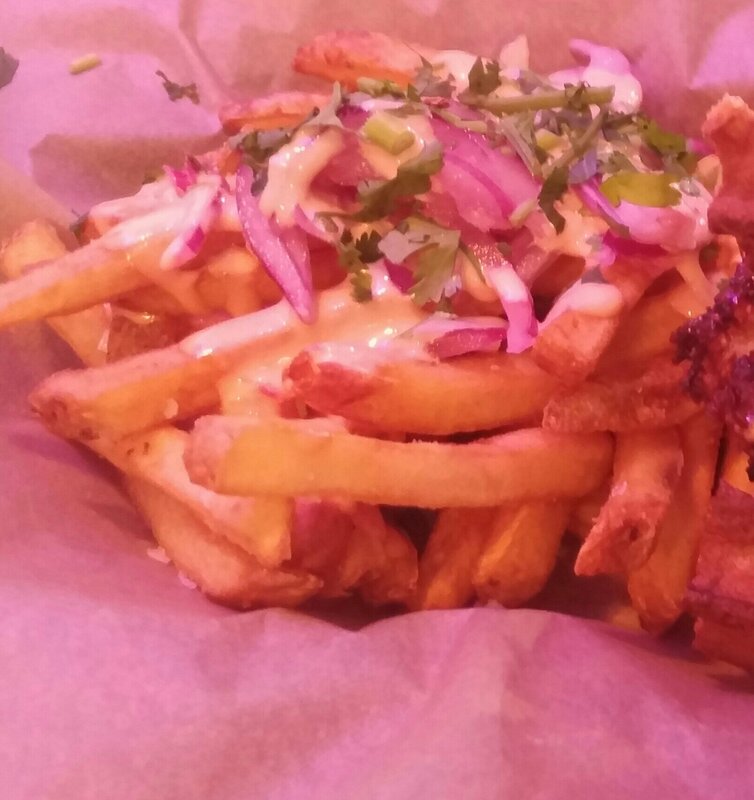 I did very much like the topping (especially the pink pickled onions and sriracha mayo). All in all a fantastic dish to reinvigour the taste buds mid boozy session or in our case to start the evening off. 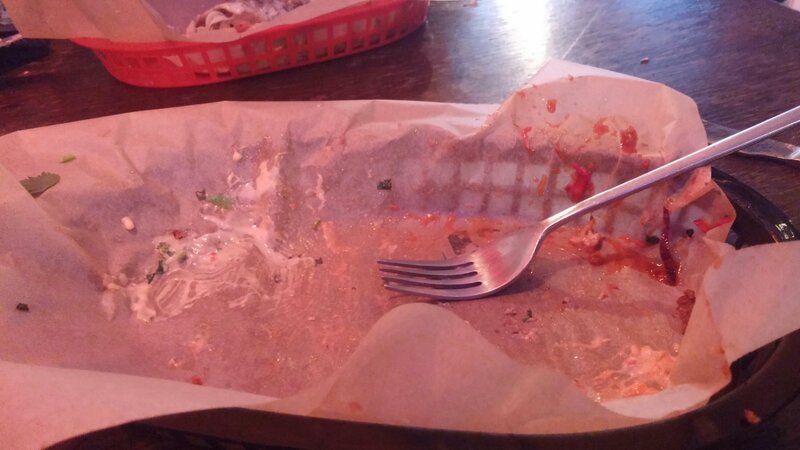 The picture below is testimony to how much I enjoyed it. 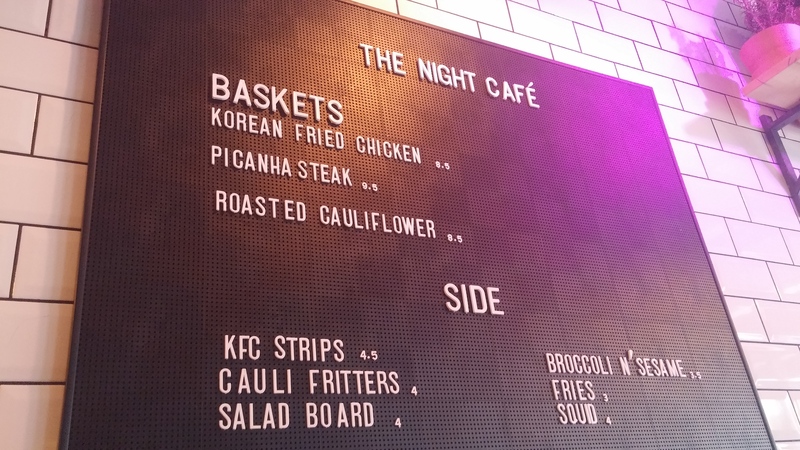 Mrs. SF went for the rather interesting sounding roasted cauliflower number (£8.5, £9 with fries – no need for the latter is my advice). As readers will know I am very much a carnivore, but this veggie option certainly sounded a cut about your bean burger. 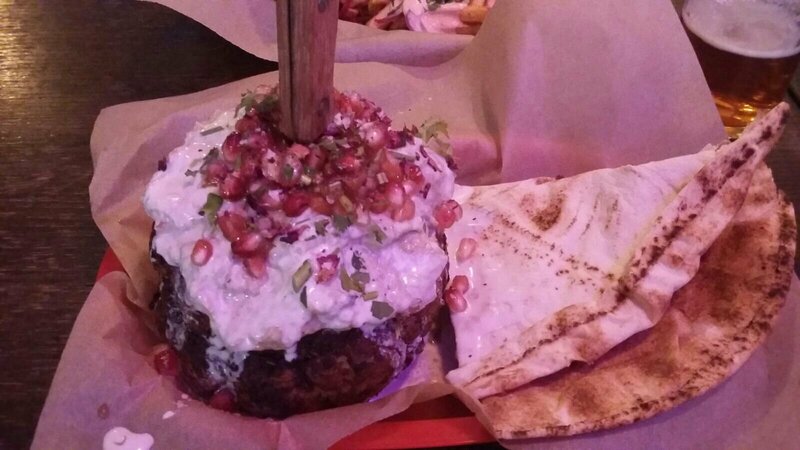 What arrived was rather pretty, with a liberal sprinkling of those little gems that are pomegranate seeds, and absolutely huge (being a whole head of cauliflower). Below the pomegranate was a layer of smokey aubergine puree (baba – with a serious thwack of garlic in it) and finally the cauliflower which had been smothered and cooked (only lightly so it retained a bit of bite) in middle eastern spices. The top bit was really nice and jam packed with flavour, but it got a bit the samey as Mrs. SF worked her way through it. It came with some lovely flat bread – great for mopping up the aubergine puree. Mrs SF said she would have preferred it if the cauliflower head had been broken up a bit before the spices were applied to allow for a more even distribution of the spices etc. and also for more of the stalk to have been trimmed off before cooking it. Notwithstanding this she liked it and from my tasting of it I thought it very nice. I would, however, suggest it would work best on a sharing basis rather than as a solo dish. So, if there are two or more of you, order the chichen and/or the picanha as well and have a bit of each. Not sure re soft drinks (none on the list and forgot to ask what they had – definitely don’t have mineral water though). Suspect just the usual soda suspects are on offer, but could be wrong. 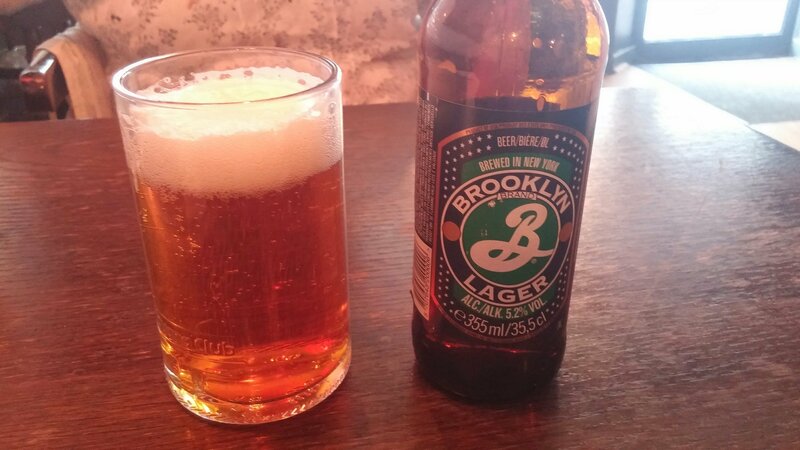 I went for a beer in the form of a Brooklyn lager (£4.5). Perfectly nice and went quite well with my Korean fried chicken and waffle number. On the wine front, I personally think they are missing a trick with a somewhat pedestrian selection. To go with the laid back, quirky, nature of the place why not stock some more unusual, fun, stuff. Some bottles from say the “Some Young Punks” range would perfectly reflect the quirkiness of this place. The Some Young Punks’ “Monsters, Monsters, ATTACK” riesling would be a pretty darn good pairing with both the cauliflower and the Korean chicken and their “The Squid’s Fist” or “Naked on Roller Skates” wines would (I think) go well with the picanha. 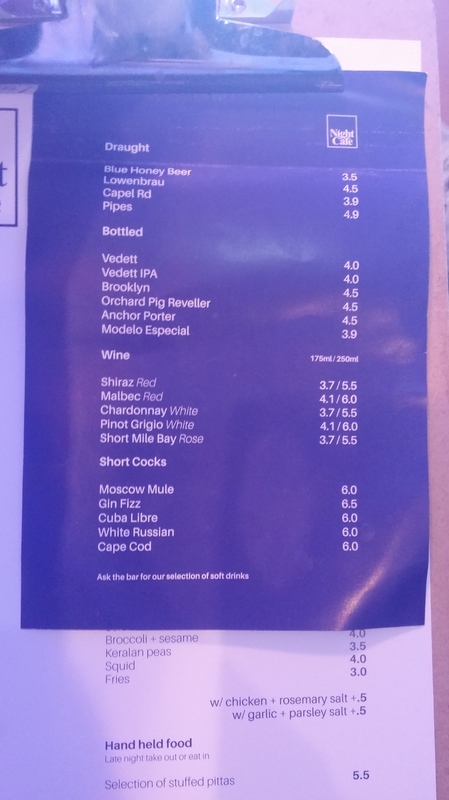 Prices for the wines by the glass on offer (not sure who they are from, bar from the Short Mile Bay Rosé) do look fairly reasonable. I really liked Blue Honey Night Café/the Night Café. Nice people, a lovely relax vibe and above all great food. Can’t ask for much more really (bar from bit more adventure on the wine front perhaps). Fab place to kick off an evening or go to when the munchies kick in. Great also to see utilisation of otherwise dead space to mutual benefit (including us lucky Cardiff diners). We paid £21 for our two meals and a beer (Mrs. SF had water), which I thought very good value for what we got. Would I go back? 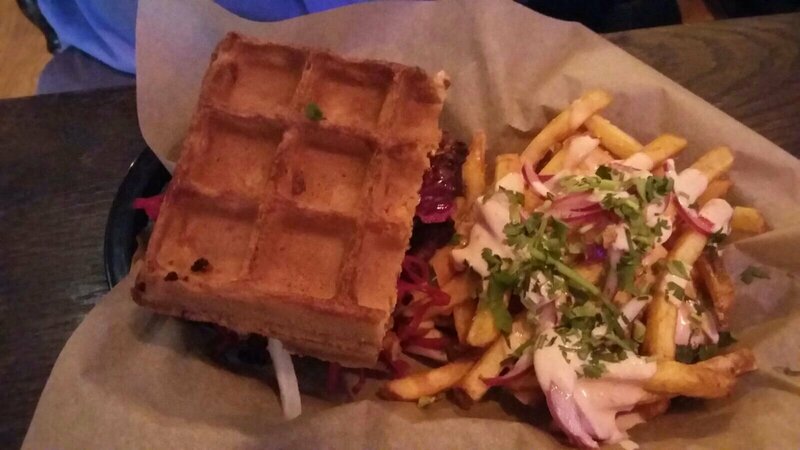 Definitely – the Korean chicken and waffles were awesome and I love the sound of the biryani bowls. May well try the picanha next time – based on the picture sent to me it looks lovely. I, as a avowed carnivore, even enjoyed the cauliflower dish. A great addition to the Cardiff food scene in my humble opinion. Twitter: @bluehoney_ (account doesn’t seem active). Opening hours : Tues – Sun : 17.00 – 01.00; Mon: closed. Kitchen starts serving food from 6pm (drinks available from 5 pm). 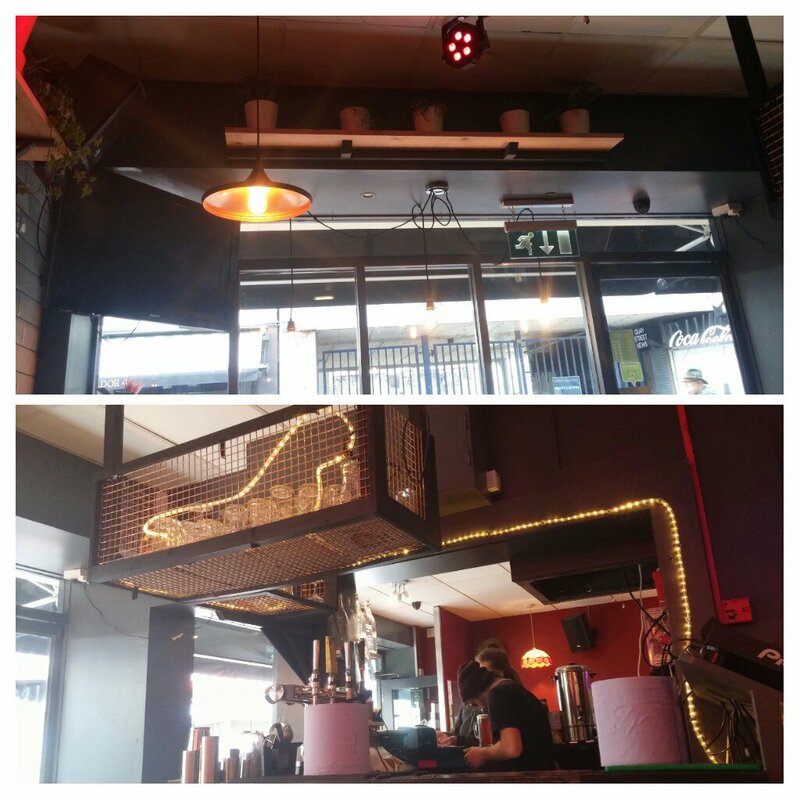 This entry was posted on May 14, 2017 by solicitingflavours in Alcoholic drink, Australian wine, beef, bistro, bitter, Blue Honey Night Cafe, cafe, Cardiff, Cardiff restaurant, cocktails, Diner, Drink, Dry white wine, Fast food, Food, Food and wine products, Fried chicken, IPA, New restaurant Cardiff, Night Café, real ale, Red Wine, restaurant review, review, Riesling, Sandwich, Shiraz, steak, Stout, Street food, Sully's, Take away, Takeaway, Uncategorized, vegetarian food, waffles, Wales, White wine, Wine, wine mark up, wine pairing, wine pairings.